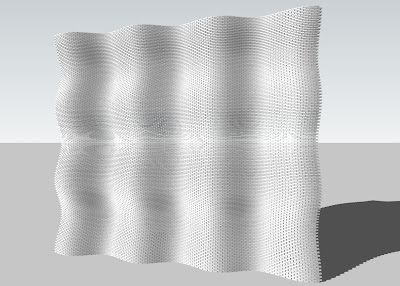 I attach some images of my on going experiment with DC as parametric design tool. I hope to share DC's uncovered but great potential in designing NOT in modifying your components. 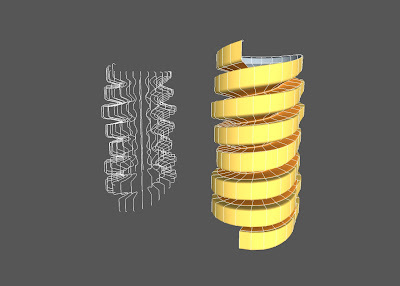 To someone who concerns parametric things, I think, these images would be interesting. 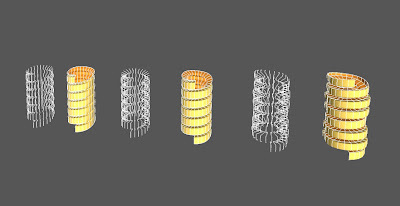 These 3 images mimic bamboo mat's structure which is used in many Asia countries. Look at this picture. 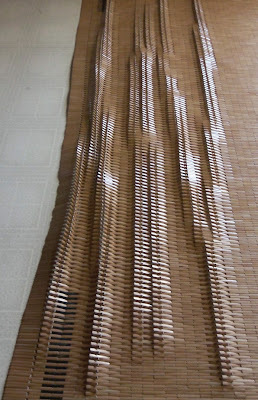 I made something like landscape with real Bamboo mat. 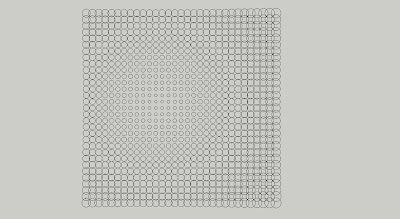 This mat inspired me to model with DC. This curved wall is made of bricks. Real-size brick components not image mapping. 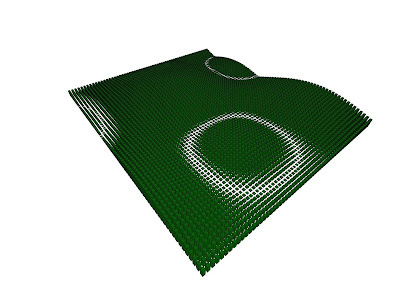 With only one push/pull of a little circle on surface of the brick component makes third green one. 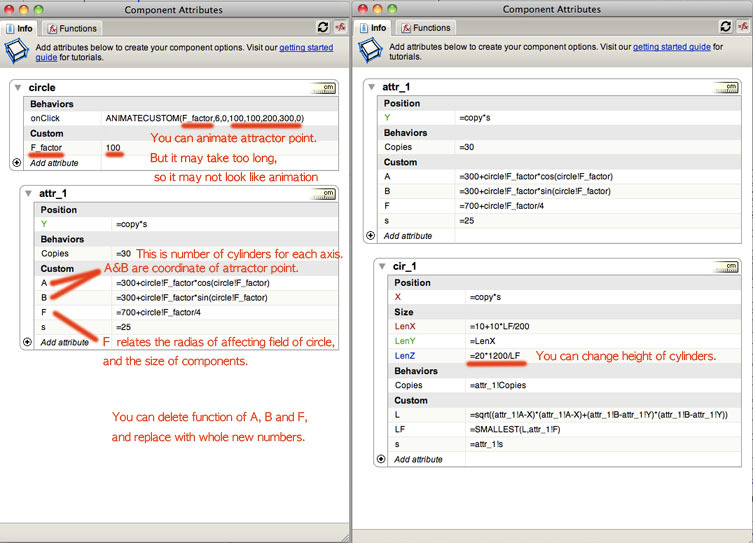 And these 2 image show another movement of components in height by mathematic functions. Last 3 images are example of attractor thing. Accordance with the distance of specific point, the height or the size of components varies. When the LenZ=0, second model becomes first one. Like other real parametric tools, with DC, you can also make some patterns you conceive or do form-findings you can't imagine. It's possible, I think. Only problem is the limitation of DC environment. (DC is not modified for designing) I hope there would be some considerable improvements for DESIGING. I am still experimenting another possibility of DC and when something has come out I will introduce here again. I attach 3 SKU files of 4models in zip. Last edited by taekle on Sat Sep 11, 2010 4:22 am, edited 9 times in total. My gosh, this is great! And also: Welcome to the Forum! shura wrote: My gosh, this is great! Thanks for your concern and hospitality. It contains 3 SKU files. You can check out the functions of each. Unfortunately I don't know anything about creating DCs, but I am really interested in how you are doing this. Could it even be possible to make them interactive in order to tweak the patterns? I should have made these models considering sharing. But I missed attribute option setting. Understand me, I did these things when I just began studying DC. You should use Sketchup PRO 7 or later. DC is for Pro only, as you know. and when you select sub component inside you can see right one. And when you check Menu/Tools/interact and click the component it would animate. It may take too long because of its number of copies. But it is still animation, literally. Wait... you can see some changes. There are no "serious looking formulas".. They only have sine, cosine functions or mere simple calculations. i'm just experimenting with yours for now. I hope you guys didn't wait too much for my next result of DC experiments. Hopefully, I did something else during this weekend. 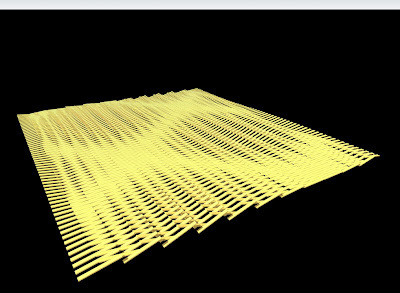 After making several models and patterns only consisted of bricks, blocks or sticks etc, NOT of surfaces, I became very wonder how to make surfaces with DC formulas. 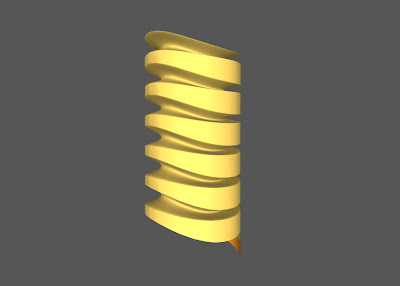 And I want to do more things in parametric way with DC. Can it be done? 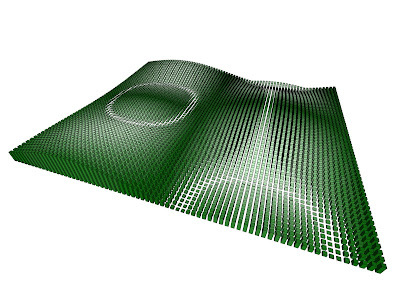 Fortunately during this weekend experiments, I think, I found out a solutin to make surfaces to the models which is totally conceived by DC formulas. 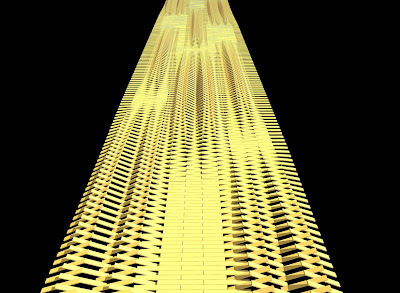 And it looks very parametric to me. I should be honest to tell that, as you know, making surface is not possible within DC, cause it doesn't support any drawing tools!! Actually I used Fredo6's Curviloft Ruby plugin to make surface from the set of sectional profiles which were transformed by DC formulas. 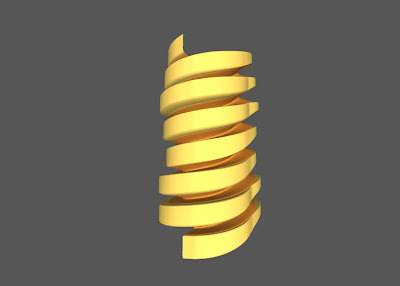 Curviloft plugin, especially in this case, the 'loft by splines' looks wonderful solution. 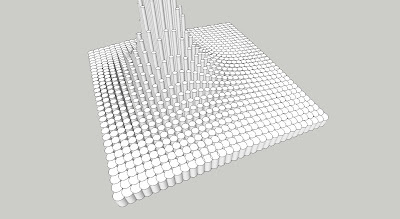 And the way doing with this plugin is also looks very parametric. 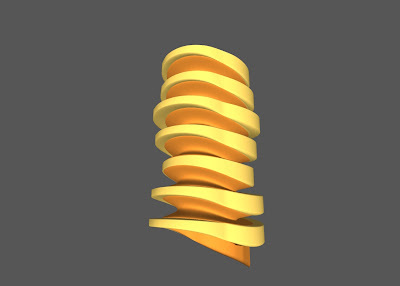 This tells how I did above transforming spiral thing. All I drew for model were two sectional profiles, and everything else was done by DC and 'loft by splines'. 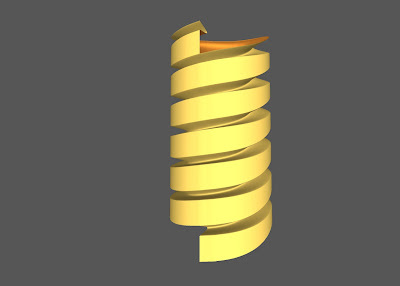 Cause it occurred crashes or unexpected results to loft with circular formation of splines, I did loft separately and combined later. How do you guys think doing thing in this way? I attached more images of 3 different variation from single DC model. I changed several attributes of original DC formulas and it resulted in these 3 models. All three are spiral things. 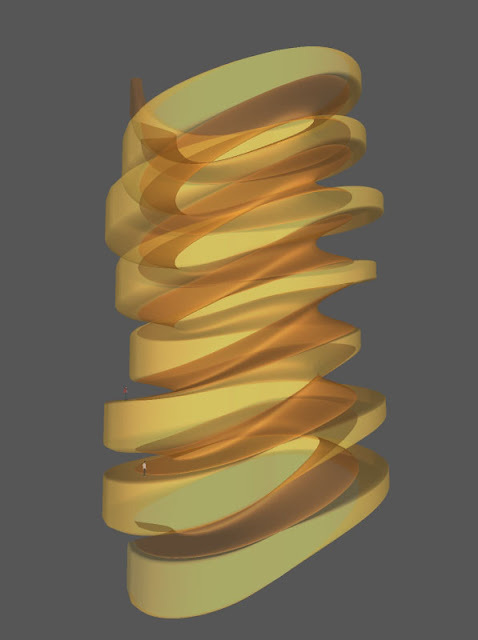 They vary in volumes of spirals, depth of concave,etc. 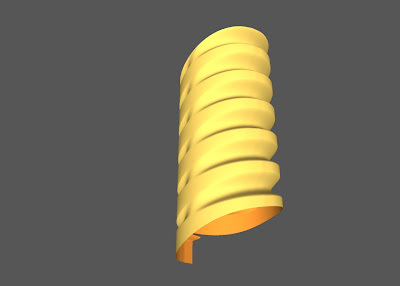 You can even change the radius of spiral circles, the height of floor, degree of variation of volume, and even more. Look, 3 different types of variation. 1) type one with shallow but changing depth of concave. 2) type two with deeper and not changing concave. This has chaging volume along with spiral. You can see original a set of copied and transformed profiles by DC, beside lofted surface, and Nancy & Sang. I wonder any plugins of SU can make like this. Attached file below shows the formulas used in here. I am not sure you guys would be interested in such mathematics. But this makes all these things happen. And below it is attribute option window. 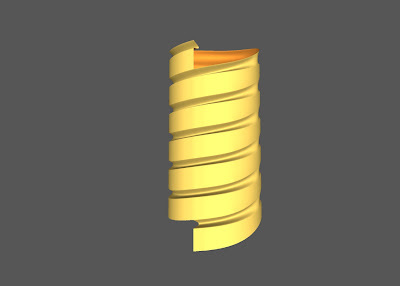 you can see changeable parameters beside a set of transformed profiles, and another variation of model. 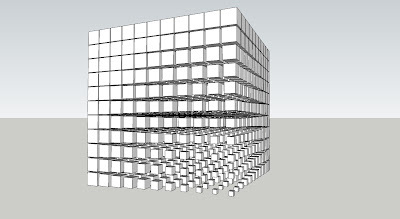 I did these things only on Sketchup, not Rhino, Max, or others. More encouraging thing is that the possibilities of Sketchup is not over yet. Enjoy the power of SU with DC. For more information and larger images visit my blog. Last edited by taekle on Tue Sep 14, 2010 12:49 pm, edited 3 times in total. great stuff, taekle. I have always thought DCs have great potential. the problem with them seems to be the need to understand all those formulae. I am sure it would be put to more uses if we were able to understand how it works. as it is it demands a maths-inclined person to handle it. but, please, keep up with your investigations. a few months ago I suggested that someone could create a plugin to create facades in which you could have windows in several stages of opening (somo closed, some open, some half-open, etc) so as to simulate a real life situation of use. people suggested I use DCs but nobody explained how to it. perhaps you could find a way to do it. Edson wrote: I am sure it would be put to more uses if we were able to understand how it works. as it is it demands a maths-inclined person to handle it. Edson, you're right, it would be easier to use DC formulas if you are familiar with maths. But comparing with other (real) parametric applications, like Rhino Grasshopper, or algorithm codes, the knowledge of maths needed in DC, I think, may be nothing but arithmetic. In this point of view, paradoxically, limitation of DC seems to make easier to get used with DC. (But the UI is terrible indeed) So I hope to be improved in the aspect of environment and UI of DC both. And the window problem seems not that difficult. DC has Random function. So if you had made formula of opening degree of windows by means of this random function, you might have get what you wanted. Window opening is quite simple with DC's. The door can be set to any opening angle required. 1 click closes door, another click opens it to the required angle. You could create DC windows in a similar way to the door. You could also create sliding sash windows if required, set to open a certain distance (mm) as opposed to an angle. the difference with rhino is that a lot of the maths are happening behind the scenes and/or are presented to the user in a more user friendly fashion. using DC seems awesome for experimentation but like you said earlier, it needs to open itself up as a design tool.. as in, you should be able to take some of your DC examples and fairly easily begin applying them to a physical item (if you so choose).. it'd be great if some of these patterns you've created could easily be applied to a surface for instance..
it'd be sweet if you could somehow incorporate the DC parametrics with ruby scripts to give something of a user interface instead of using the DC dialog. that dialog is just plain confusing to most people and not encouraging at all for most people to begin to learn it. until something like a front end UI for su parametrics occurs, i think it will be limited to very few people but please, continue posting your experiments etc.. they're very interesting. Not the surface though. Basically, in my case, it's the application of shapes to said surface. 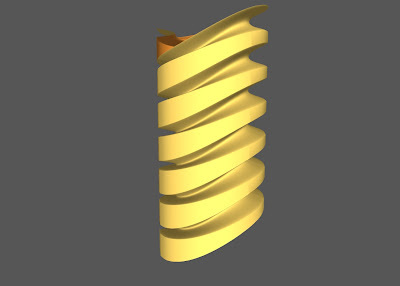 In a roundabout way, grow mixed with extrude edges. I should note though that I wasn't using grasshopper which is more in tune with this topic. I was using rhino's paneling tools. If you want a sweet ruby idea, download the paneling tools manual and check out some of the example functions. Last edited by jeff hammond on Mon Sep 13, 2010 10:40 pm, edited 1 time in total. Maybe I posted the wrong example but I'm at an airport now so I can't do much about that. I'll put up a better example later. 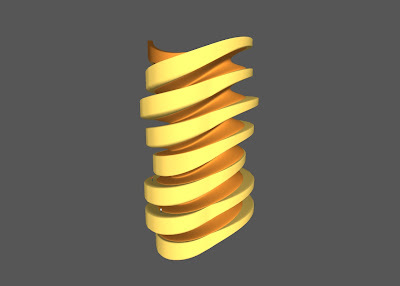 But yeah, I know what extrude edges can do and it can't do this. So... what is it trying to do that's 'different' ??? Jeff Hammond wrote: you should be able to take some of your DC examples and fairly easily begin applying them to a physical item (if you so choose).. it'd be great if some of these patterns you've created could easily be applied to a surface for instance..
And Unfortunately, is there no way I can use Ruby with DC? If any, I only have beginner's idea about Ruby scripts yet. And as you asked me to continue, I did one. And I'm not even sure this is what you meant exactly. Last edited by taekle on Tue Sep 14, 2010 5:32 pm, edited 1 time in total. Thank you for posting the screenshots, it does not look too difficult to learn DC. I for one don't feel afraid of the learning curve in SU. Although it will take some time to get into it. "I have always thought DCs have great potential. the problem with them seems to be the need to understand all those formulae. I am sure it would be put to more uses if we were able to understand how it works." why not have a workshop of some sort? TIG, that 'EEbyRailsByFace' is a nice one! By the way: do you still remember Blend plugin? Taekle, excellent examples...I too am intimidated by the math involved, but am now more interested in learning after seeing what you've done here. shura wrote: why not have a workshop of some sort? 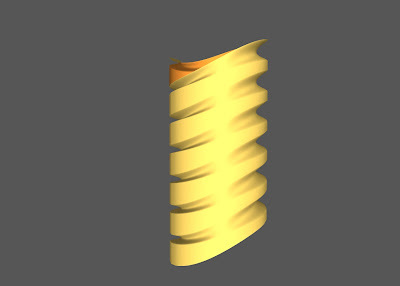 Hi mates,I'm also the one who concerns parametric design too .Thanks taekle for your very usefull tips. I'm new to Dynamic Component,this my very first try. Can't say I'm doing anything as exciting as this - but for a bit I was playing with generating timbers and joinery, and also generating tools for compound roof design. Because I need to have the volume of the timber untouched (and in one component) - I'm not modeling the backing cuts or end cuts - but creating guidelines over the volume, and then using marker components to swap out for joinery, that are also dynamic. The wireframe house shape in the beginning of the video is also a dyn component - I can change plate height, pitch(es), etc. I use this when creating gable shapes, then I lock it and use it as a guide for my framing. cucsat2003 wrote: I'm new to Dynamic Component,this my very first try. Cucsat2003! You are the first and still only one who uploaded a DC parametric model except me! Please keep posting your results. Shura, I feel happy that my screenshots were helpful to you. And the result of 'blend plugin' looks fantastic! It inspires me very much! Thanks. 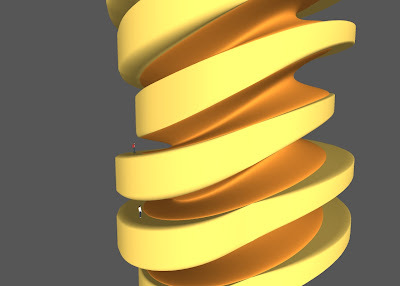 D12dozr, I hope you still keep interesting DC parametric things. I will post with another DC model(s) ASAP. By the way, how can the workshop be done? Hi guys, As I said before I've come back with another 2 DC parametric models. They are very simple comparing with the ones I posted before. And I am conceiving something different in DC parametric model, I'll also introduce that here someday. Then enjoy DC parametric world again. As you see the formula is very simple. 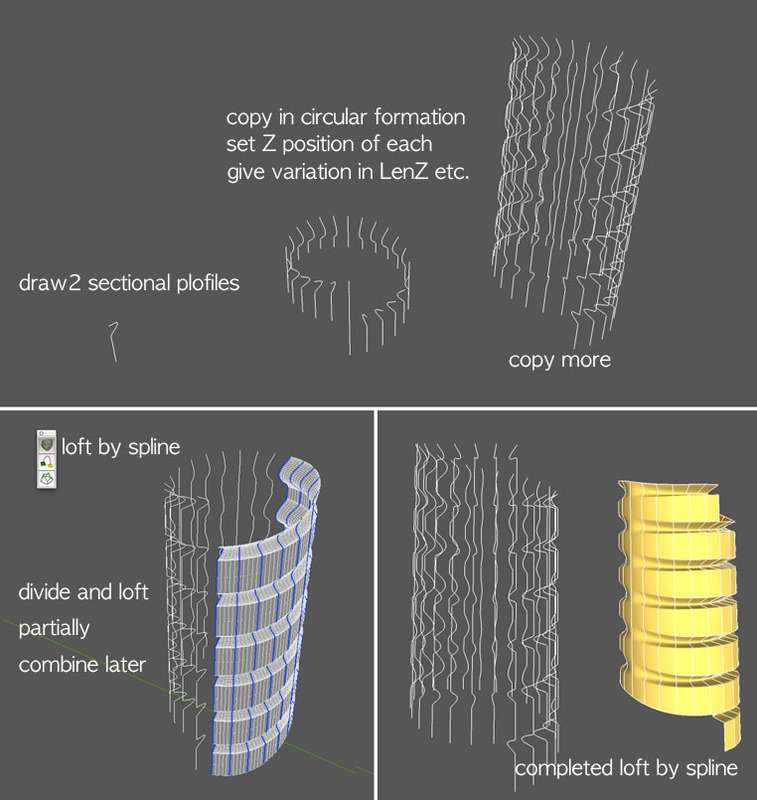 After 'loft by splines' of this set of profiles(I only drew a half circle), then copy 3X3. That's it!. I'll give some explanation of the key parts(or steps) of this formula. 1. Draw a half circle in any size along with (in this case) red axis('X' axis). and again set formula to copy in green axis('Y' axis). 4. In LenZ of 'half_cir', type any formula you want. I like to use 'sin' and 'cos', cause they are periodic. In this formula you should include 'X' or 'copy' of its own and 'Y' coordinate of 'set_cir_X'(parent). 'Y' coordinate of parent component will make sub-component changing along with 'Y' axis. 5. In RotX of 'half_cir', type '=if(copy=odd(copy),180,0)'. This will make every two half circles upside down which then looks like wave or pulse. 6. After complete every step then copy and move to other place, and explode every component included. Next one also has regular pattern but a little bit deformed. There are two differences to first one. In this case you should set the 'PosX' of 'half_cir' in formula. Then set 'LenX' accordance with PosX. I mean [Nth LenX] = [(N+1)th PosX] - [Nth PosX]. Little bit more complex but not that difficult. 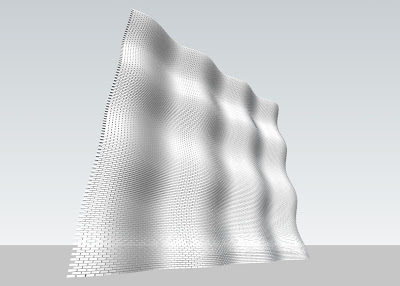 Any one who feels interesting in DC parametric process please try yourself and post your own results here! I uploaded first one's SKU file on my blog. Visit my blog and find your way. Last edited by taekle on Mon Nov 01, 2010 5:11 pm, edited 2 times in total. out of curiosity, will you post a hidden line view of the waves and maybe the model stats (face count, # of edges, etc) ? ha, nevermind i can get it from your blog i see. Jeff Hammond, sorry, I fixed link on my blog, please try again. (In Google doc's, sometimes, this kind of link error occurs. If you still have problem then let me know. 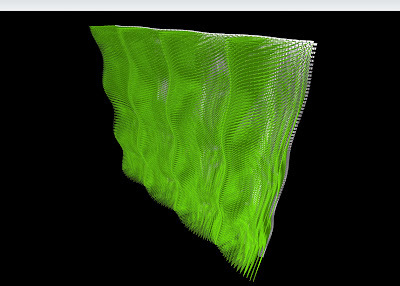 I just visualized the movement of a simple DC parametric model. Back again, and again holding my breath. I wonder if I ever get my head around DCs. 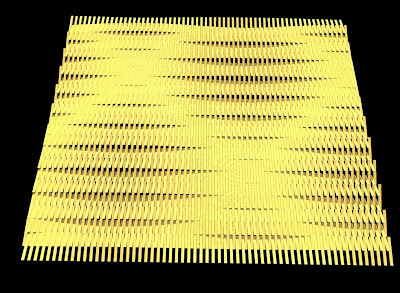 That last visualization is really great, and thaks for sharing the waves pattern.